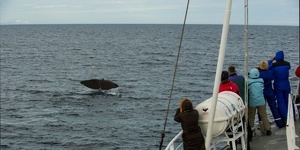 Spend 11 days exploring Norway and cruising the waters of the arctic! Starting in Bergen, you will cross the Arctic Circle twice, pass the North Cape, visit the turning point at Kirkenes and stop in the medieval city of Trondheim. 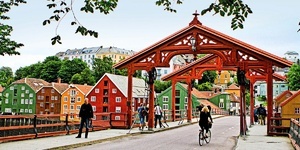 Before sailing from Bergen, you may wish to explore this cultural gateway to the fjords. Spend some time in one of the outdoor cafés and restaurants in the Bryggen district, a recognised UNESCO World Heritage Site. Other attractions in Bergen include the Fløibanen Funicular, the Fish Market, and Fantoft Stave Church. We sail further north to Ålesund, a beautiful town and a perfect example of the Art Nouveau style. 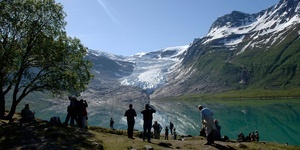 Then we will sail into the spectacular UNESCO listed Geirangerfjord where you can enjoy a scenic excursion including a spectacular drive down the winding Trollstigen Pass. The architecture and surroundings in Trondheim create a beautiful setting for any outing, should you prefer a guided tour in Nidaros Cathedral or a casual stroll through Bakklandet. In the evening we continue towards the land of the Midnight Sun. Crossing the Arctic Circle is one of the highlights before we arrive in Ørnes. The Arctic Circle marks the southern extremity of the polar, 24-hour sunlit day - often referred to as the “Midnight Sun”. In the evening we reach Svolvær, the administrative center of the Lofoten Islands. These islands are renowned for their small fishing villages with their bohemian atmosphere surrounded by majestic granite cliffs and white sandy beaches. Complete your visit with a stroll between the stock-fish racks and ‘rorbuer’, the traditional, red fishermen’s residences. During the night we pass the magnificent Trollfjord and sail through the spectacular and narrow Raftsund strait. Here, you can admire the rugged mountainous landscape jutting up against the horizon under the endless sun. 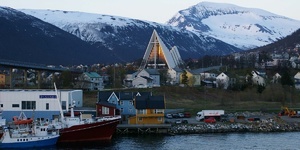 We continue to Tromsø, a city with many lively restaurants and cafés. Today we arrive in Honningsvåg, the starting point of our excursion to the spectacular North Cape, the northernmost point of mainland Europe. From the fishing village of Kjøllefjord you can get a “Taste of Lapland”, meeting a real Sámi family. Ports visited today: Kirkenes, Vardø, Båtsfjord, Berlevåg. Summer in Kirkenes is superb with 86°F degree temperatures at its hottest. The town is known as the capital of the Barents Region and the gateway to the east, with people here speaking Norwegian, Sámi, Finnish and Russian. As we turn south, the northbound ports previously visited by night are now seen by day. Start the day with a summer breakfast at the North Cape Hall (optional excursion), which is firmly perched on the massive cliff marking the northernmost tip of mainland Europe. 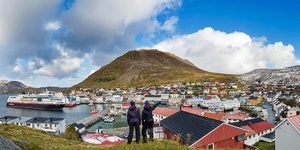 From here we make a stop in Hammerfest before our next major port of call, Tromsø, where you can take part in a very special musical experience, the Arctic Cathedral Midnight Concert. Passing through the Lofoten Islands the ship negotiates a stunning network of inlets and isles, before moving on to what is the highlight of the voyage for many, a possible detour into the spectacular and dramatic Trollfjord. 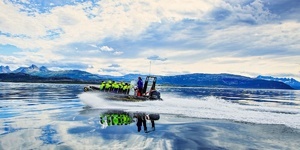 Join us on a fantastic safari by RIB- boat through the Lofoten archipelago under the Midnight Sun! As we sail past the Helgeland coast you can enjoy views of the hundreds of islets, fertile farmland and lush meadows. Today will also be our last one north of the Arctic Circle. 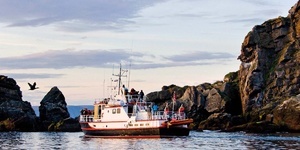 The Vega Archipelago, a UNESCO World Heritage Site, is close to our call in Sandnessjøen. We arrive in Trondheim in the early morning. Nidaros Cathedral, in which three Queens and seven Kings have been crowned, is Scandinavia’s largest medieval building and worth a visit. Your tour ends here.